As 2010 winds to a close (What? Where did the time go? Seriously! ), the time has come for best of the best lists to be calculated. I have always wanted to make a best of list for the books I read each year. I have friends who creat their personal best lists with books, music and movies… but I can’t do it. I think the problem is I can’t ever give books solid ratings. Sure I try with my goodreads, but at the end of the day it’s always arbitrary and highly dependant on my current mood. I prefer to use goodreads as more of a directory of books read to help refresh my memory. Luckily, lots of other people have this ability and create lots of great lists to check out. I like to use these lists for a few things: it’s a good way to catch any awesome books I missed this year and add them to my ever expanded to-read list. It’s also a great way to double-check my ordering at the library. I could have missed something really special and that would be a downer! If you are really into best of lists, Largely Hearted Boy is a great place to hang out. This truly a blessing, he compiles every single best list for books and music. It’s really awesome and also a fantastic way to increase your to-read list very quickly! I discovered Largely Hearted Boy through a great Reader’s Advisory blog, RA for All. The woman who keeps this blog was my professor in library school and really an expert on Reader’s Advisory. I find a lot of what she has to say applicable to my job, even though I work with children and not adults. It’s also a great way for me to stay current with new books for adults. Since Thanksgiving is next week, I decided to do a turkey themed storytime this week. It’s a bit early, but we don’t have storytime next week and I figured most of the kids would know it’s coming. I was right! I will be honest, I planned this way back in August and then when it came time to pull the books they were all gone! It was totally my fault and I felt silly. What ended up happening was me putting books on hold and hoping for the best. Luckily, everything worked out and we had a good time today! First we read, I’m A Turkey by Jim Arnosky. This is a cute book about a turkey named Tom. The kids thought this book was so funny. One interesting point in the book is when Tom points out that the next turkey the reader meets could be one of his flock or even Tom, himself! As a vegetarian, I have no problem with what this sort of insinuates. I don’t think any of the kids noticed since the book ends with gobbling and so we all gobbled like crazy. Next we read Five Silly Turkeys by Salina Yoon. This is a super short book about 5 very silly turkeys. Basically, it is a fingerplay that has been turned into a book. It could easily be made into a flannelboard or just be told by using your fingers. We also read Charlie Chick by Nich Denchfield. I have read this book before in storytime. It is definitely one of my favorite books for toddlers ( I just added to my shopping list for my 2 1/2-year-old nephew ) and fit well with this theme. Charlie may not be a turkey but he does like to eat- and so do we on Thanksgiving! I also read Who Hops by Katie Davis. This is a great go-to book for storytime. It’s very funny and interactive. Books like this beg to be read in storytime. 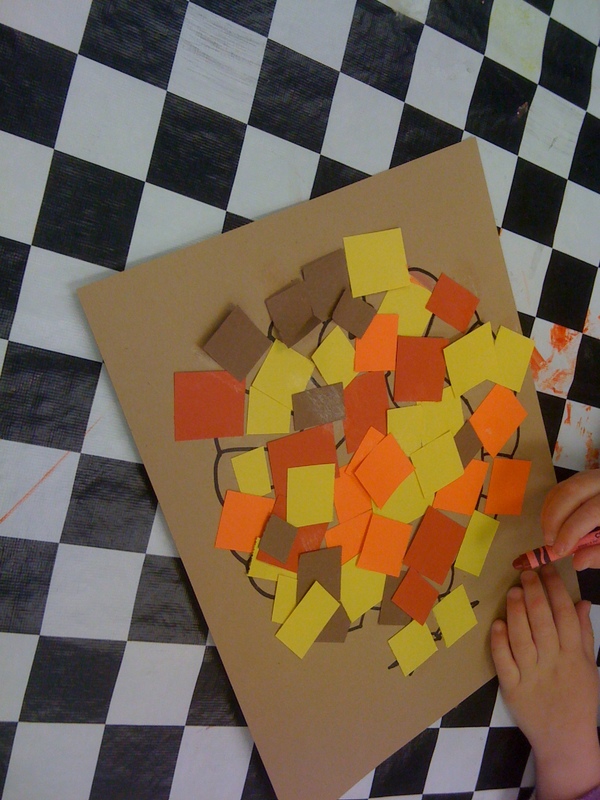 There are lots of fingerplays and songs that are appropriate for a Thanksgiving or turkey theme. We changed our usual If You’re Happy And You Know It to If You’re Thankful and You Know It. We played a game of “Turkey Says” and I used a turkey puppet to give directions. Basically this was a waterdowned version of Simon Says. We also discussed being thankful. Everyone got a chance to say what they are thankful for. This was my favorite part of storytime today. Lots of cute answers such as ponies, kittens, themselves, snacks at preschool (specifically fruit snacks) and family. What am I thankful for? My awesome job (the best in the world!) that allows me to spend time with my sweet, hilarious, cute and very awesome storytime kids. 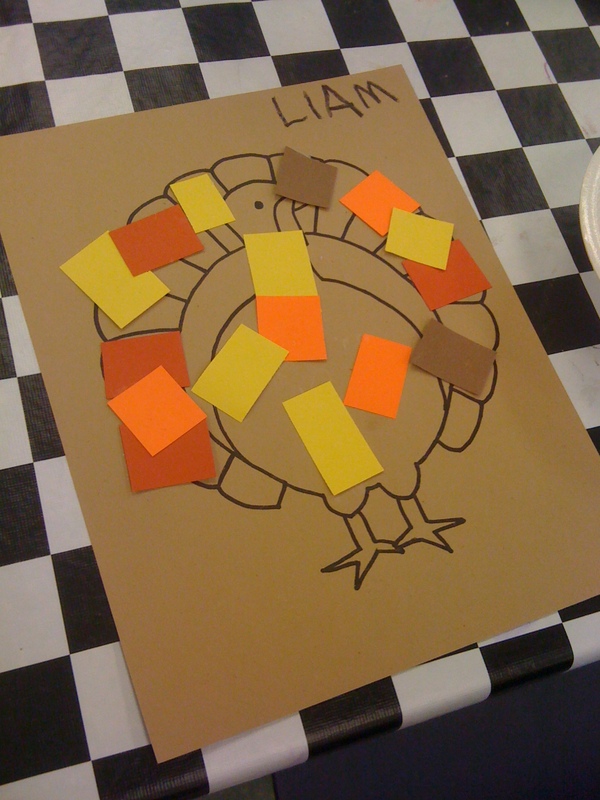 For our craft this week, we put feathers on a turkey. She told me it was the back of the turkey. Too cute! Posted in bonus program	by Sarah H.
I don’t know how regularly people check out my blog (It’s actually sort of insane to think that real people out there in the real world read this) but those of you who check up regularly probably noticed I neglected to post a storytime last week. Normally, you can just chalk this up to me be lazy but last week I had a real reason- I was in New Mexico for YALSA’s 2010 Young Adult Literature Symposium. It was a great experience and I took a lot away from it. 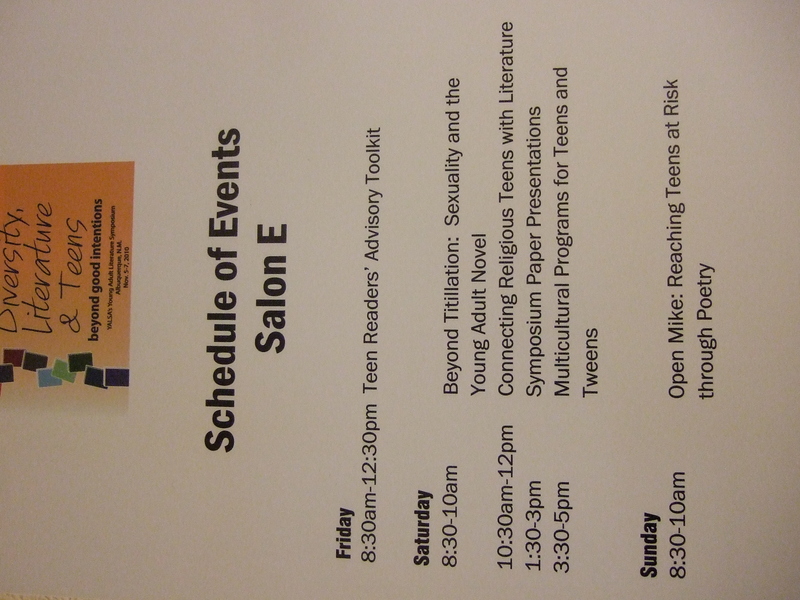 The reason I went was my colleague and I presented a session about connecting religious teens with literature. This was the first time I ever presented anything and it was really fun. I highly recommend it! Coincidentally, this week’s storytime is the last one for a while. We are going on a break for the month of December. I have a few things planned for the blog for the break. I am excited to see what you all think! It’s true, Halloween is my favorite holiday but there is one thing I might love even more… birthdays! I love my birthday, of course, but I really do love everyone’s birthdays. This was a very popular theme because of course EVERYONE enjoyed sharing stories about their birthday. We started with Don’t Spill the Beans! by Ian Schoenherr. This is a very cute book about a bear who has quite a surprise a birthday party! The kids really enjoyed this book, everyone was excited to find out what the secret was. Next we read Happy Birthday, Monster! by Scott Beck. This is a really great birthday book and everyone really enjoyed it but I think it is better suited for a one on one reading situation. There were lots of extras (the characters talking to each other etc) and I had thought it would have been no problem, but it ended up being a little distracting. However, this is a really sweet story about a birthday and also really fun. I closed with My Birthday Cake by Olivia George. This book features a little girl after my own heart. She creates quite a cake with lots of sweet treats. Unfortunately, she discovers that it is a bit TOO sweet and she really prefers the cake her mother makes her. This was the perfect book to close with because for our craft we made our own birthday cakes! This was very easy. 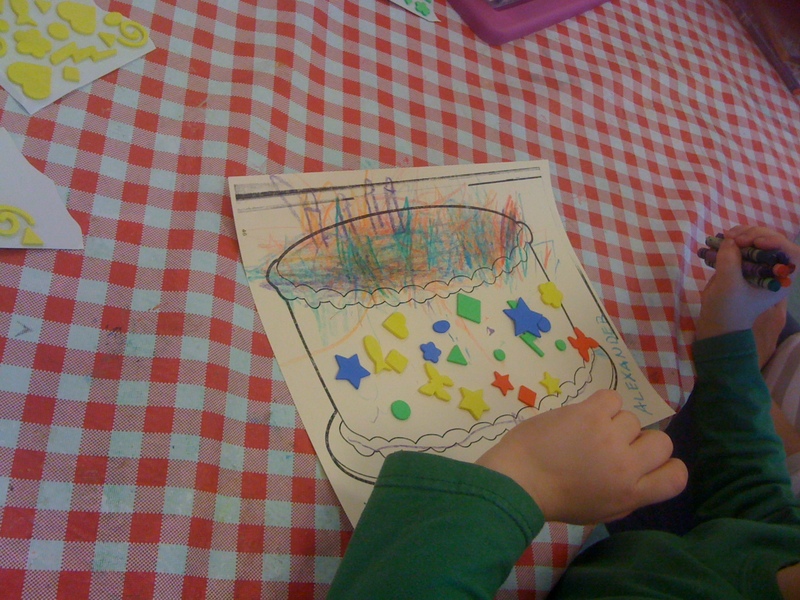 My kids really enjoy coloring and I also provided foam sticky shapes for them to stick on their cakes. Everyone got very creative. There are lots of great fingerplays and songs out there that go with this theme. Obviously good old “Happy Birthday” works well. We also sang another of one of my favorite ones. As an unrelated note, today in storytime one of my kids said “I love your shirt!”, which made the rest of the kids comment on what they love. It was fantastic and a great way to start the day!